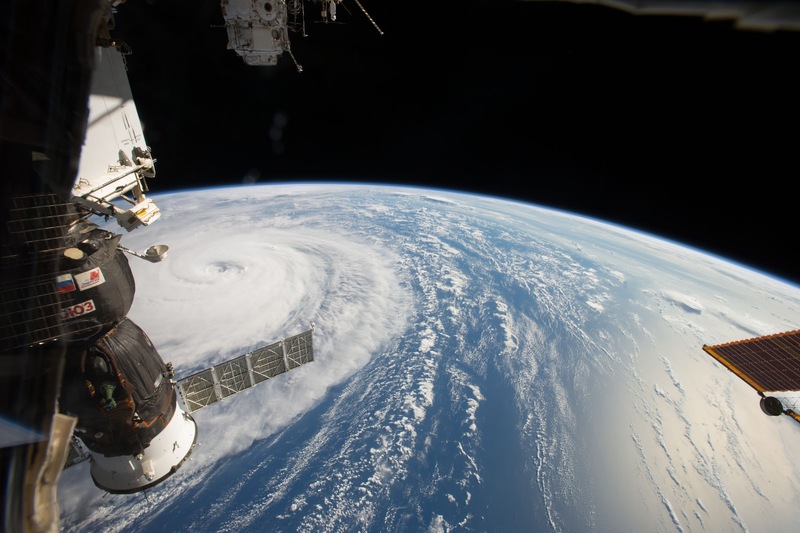 Image: Super typhoon photographed from low Earth orbit with Soyuz spacecraft in left of frame | Aug. 2, 2017: NASA astronaut Randy Bresnik photographed Super Typhoon Noru in the Northwestern Pacific Ocean on August 1, 2017, as the International Space Station passed overhead. He shared images of the massive storm on social media, writing, "Super Typhoon #Noru, amazing the size of this weather phenomenon, you can almost sense its power from 250 miles above." As of 11 a.m. EDT on August 1, the storm was centered near 24.7 degrees north latitude and 137.0 degrees east longitude, with maximum sustained winds near 90 knots. By August 2 at 5 a.m. EDT, the maximum sustained winds were near 100 knots. NASA satellites are keeping track of the typhoon as it continues its slow trek through the Pacific toward southwestern Japan.